Kathleen White, Dec. 2, 2010, Switzerland. Courtesy The Estate of Kathleen White and Martos Gallery, New York. 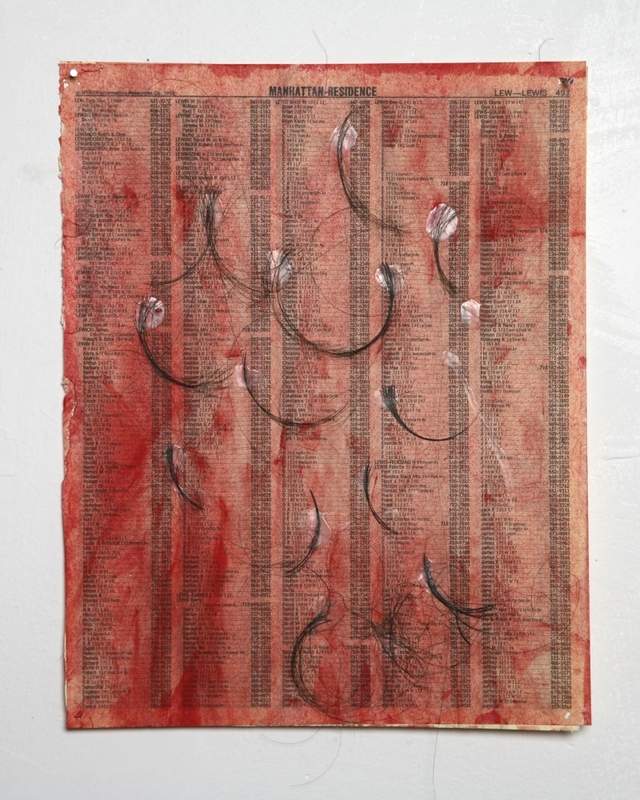 watercolor, pencil, glue, hair on phone book page 11 × 8 1⁄2 inches (27.94 × 21.59 cm). Martos Gallery recently began representing the Estate of Kathleen White and the Sánchez-White Archives. How did the artist and her work first come to your attention? Kathleen White died from cancer in 2014. Her studio is on 25th Street in Chelsea, which is very near our former location. While working in her studio after her death, White's life partner and artist, Rafael Sánchez, often came to visit us at the gallery. Sánchez had been a longtime friend of the gallery, but during these visits he spoke about White's life and work so poignantly— we were immediately captivated by her story. After moving into our new space in Chinatown, we presented White's first solo exhibition with the gallery, A Year of Firsts, in December 2017. Sculptamold and oil paint 1 3⁄4 × 2 × 4 1⁄4 inches (4.45 × 5.08 × 10.80 cm). 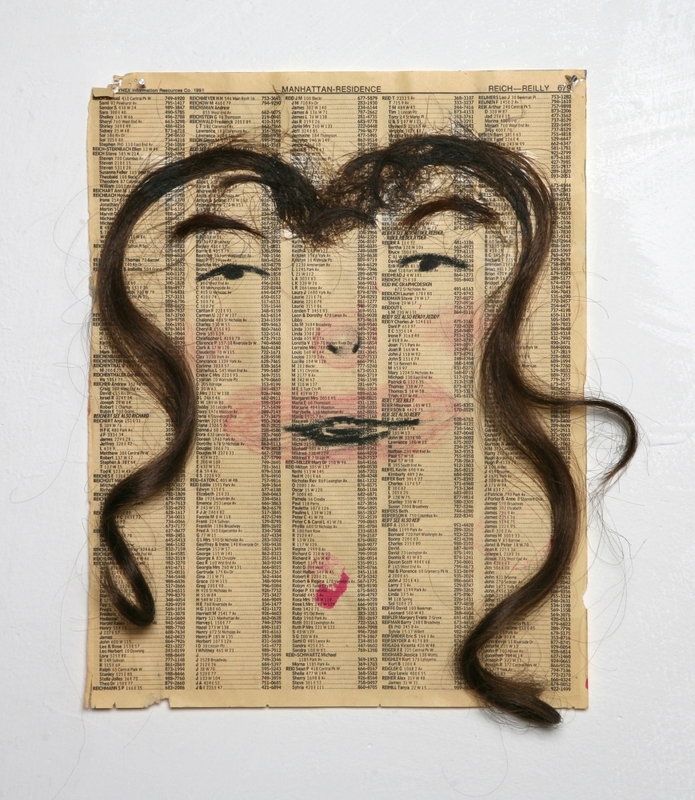 watercolor, glue, hair on phone book pages 11 × 8 1⁄2 inches (27.94 × 21.59 cm). White was recently the subject of two concurrent exhibitions, one at Martos and another at Pioneer Works. How did these exhibitions approach the artist’s life and work? White’s first show with the gallery was presented in conjunction with two separate but connected exhibitions at Pioneer Works by Nan Goldin and Kathleen White. White’s Spirits of Manhattan exhibition at Pioneer Works focused on her collages and sculptures that incorporate real and synthetic hair, often sourced from the artist's friends that were drag performers. White’s community was notably impacted by the AIDS crisis, then unfolding in the 1980s and 1990s, and the remnants of hair evoke the many people White lost to the illness. A Year of Firsts at Martos Gallery presented two major works. The first, a video entitled “The Spark Between L And D.” Here, White beats herself up and licks the blood off of her fingers. She then bandages herself up, almost mummy-like, the whole time singing “On Broadway” until she is so bound, she can no longer make a sound. You can still hear her trying to muffle through the melody. The other major work in the show is the eponymous “A Year of Firsts,” which is an intimate narrative of the tragedy and loss that became ever-present in White’s life. The work can be read like a book, or more accurately a diary and unique system of language, as it takes you through White’s year after; year after her father’s death, her brother’s death, her sister’s death, and the many friends that were lost to AIDS. The impact of AIDS on White’s circle of friends and fellow artists is a central theme in many of her works. Did she see these works as a form of activism, or were they more about reflecting on her personal experience of loss? White's work is certainly a profound personal reflection on her experience of loss. Whether it was a conscious decision or not, I believe her work was a form of activism too. The artist directly confronted the emotional effects of AIDS on her community at a time when the disease was a mystery to doctors and possessed a negative stigma within mainstream culture. How did you approach the process of putting together the gallery’s first exhibition of White’s work? What are your plans for the gallery’s presentation of White’s work at Independent? Before passing away in 2014, much of White's work was in response to her love for the family of friends she surrounded herself with. In the body of work entitled "Spirits of Manhattan," White used pages from NYC phone books to make drawings and collages. The works often depict her friends from the drag and performance scene, and often include hair from wigs. Also on view at Independent are the "Car" sculptures: vessels for fantasy, adventures, and both good and bad fortune for White. Hundreds of such works exist, and they allude to the tragedy and loss that became ever-present in the artist's life, especially during AIDS epidemic.